I miss Airfield. I really do. Despite their assurances on Facebook, there is absolutely no sign of any work started there. And they're closed since the end of October. How much planning do they need to do? They already had their planning permission, a contractor, and the animals appear to have been moved offsite - I'm not hearing any sheep baaahing or cows moooing (???). I suspect there is a snag of some sort, but they're not telling us much! So, if, like me, you miss the sight of gamboling lambs, you can turn to the Lamb Cam, where, if you're lucky, you may even be there for a live birth! In my previous post, I mentioned a food blog that has a section on Belgian food. I had a look at it just now, and found no talk of Filet américain (beef tartare - raw mince with egg, onions, capers and other goodies). A bit disappointing that. But he/she did mention Tarte au sucre (sugar tart), another typical Belgian specialty. I had only just mentioned it to BB yesterday. My granny used to make a mighty tarte au sucre, and also a tarte aux prunes (plum tart). I must check with my brother if he has the recipe for those! Very fattening stuff, but I would like to bake it once so BB knows what I'm talking about! Until I find out if we have a family recipe, here is one I found on the web. Cuberdons are a very Belgian sweet. Not that I knew that when I lived in Belgium, for the first 22 years of my life. 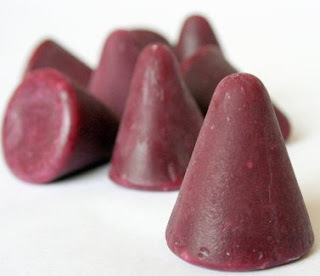 I always took them for granted, the sweetest of sweets, conical and dark red, with a firm outer layer revealing a gelatinous burst of flavour when you bit into it. What flavour exactly, I'm not sure. I wasn't brought up with a discerning palate. So when I saw them in a shop in the Gallerie de la Reine, I was puzzled to see so many different flavours: apple, orange, cherry, raspberry, orange, blackberry, violet, and possibly others. I asked the shop assistant which was the original flavour. She said it was violet, so I bought a small bag, with five violet, and one each of cherry, blackcurrant and raspberry, for comparative purposes. Well, it's definitely not blackcurrant nor cherry. But I could not taste the raspberry one among the violets. And I did read on a website somewhere that raspberry is the original flavour. Who to believe? All I'll say is that violet is delicious, a really old-fashioned taste. I used to love violet boiled sweets too, though I didn't see them in the shop on this occasion. The origins of the cuberdon appear to be shrouded in mystery. 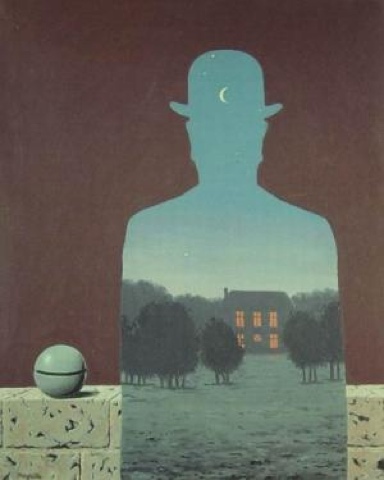 One thing I found, though, is that one of the makers is a man by the name of Geldhof. And I remember hearing a long time ago that Bob Geldhof's family was from Belgium. So there you go. A distant relative maybe? If you're in Belgium, do try them out. But beware, they don't keep for very long. You'll just have to eat them! For more Belgian specialties, I found this food blog. If you want to buy Belgian goodies, this site delivers around the world I think. And they do sell cuberdons, but I've never tasted that brand, so I don't know how good they are. When I was a kid, you just bought them by the weight or piece in the sweet shop near my school. Beautiful sculptures on the Hôtel de Ville at the Grand Place in Brussels. I haven't painted much in the last few weeks. I think my last picture is Olympic Tulips. That's a good while back. What are my excuses? Busy. Work. Family. Travel. Sunshine. Maybe I'll get back to it this weekend. And the next question then is what do I do with all of these paintings? I'm running out of wall space and I don't want to store them in the attic. 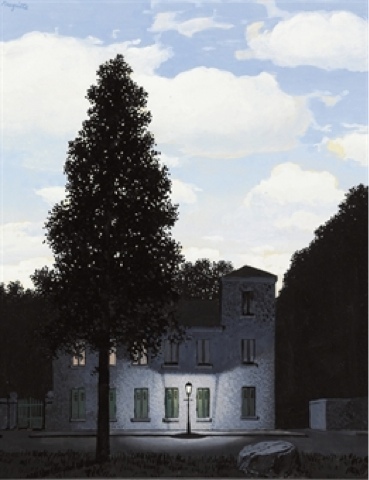 All the museums in Brussels are located beside each other, around the Mont des Arts. Whether that's by design or accident, I don't know, but it's very handy. 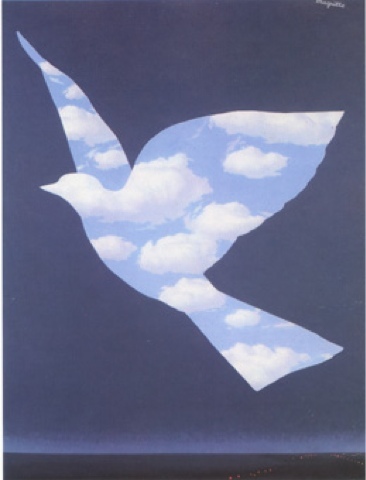 We got ourselves a combo ticket that allowed us access to the fine arts museum (modern and ancient) and the Magritte museum. For those of you who didn't know, Magritte was Belgian. Along with Jacques Brel, Eddy Merckx and Adolphe Sax in a long line of famous Belgians! 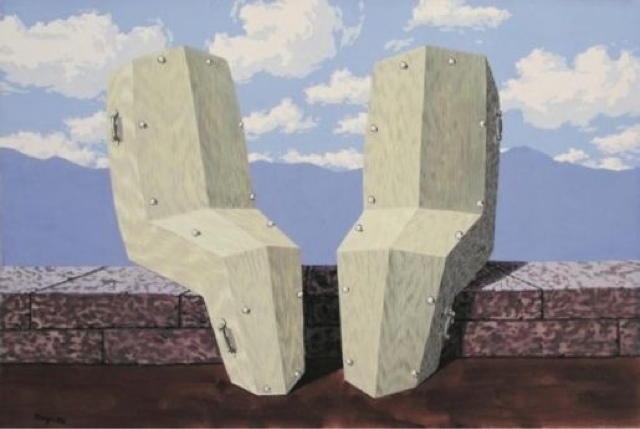 The first thing I'll say about Magritte paintings is "don't look at the titles" - they have no connection whatsoever with the picture on the canvas. 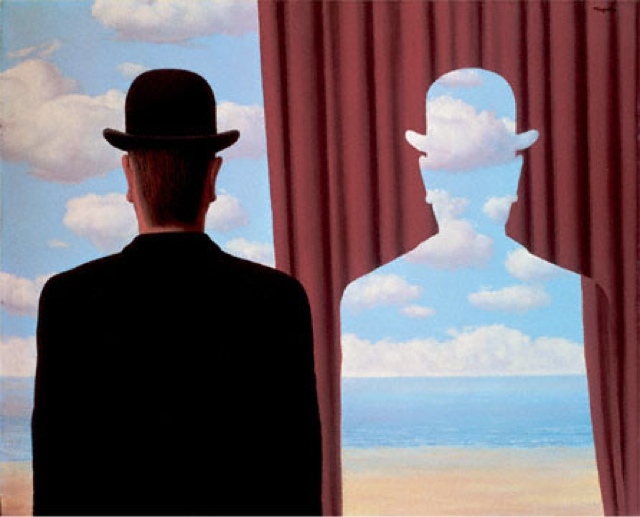 He was a surrealist after all. And I'm not sure I get surrealism. 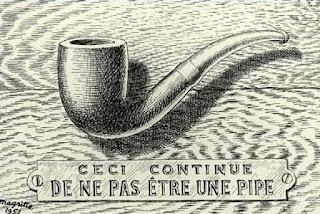 A painting of a pipe that says "this is not a pipe"; well, yeah, this is a painting of a pipe. 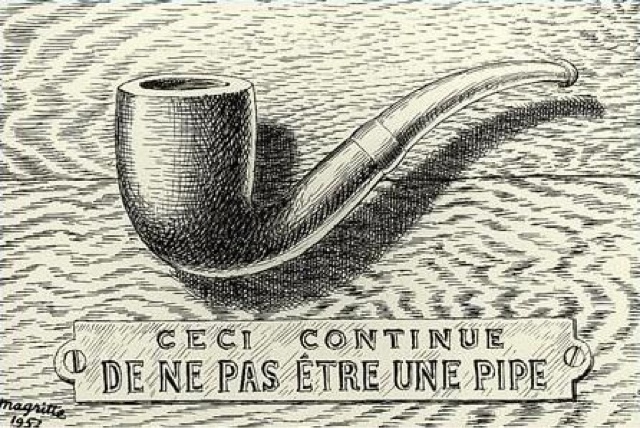 It's not an actual pipe. But what else is it? 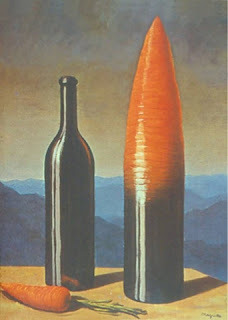 Still, Magritte's paintings are interesting. 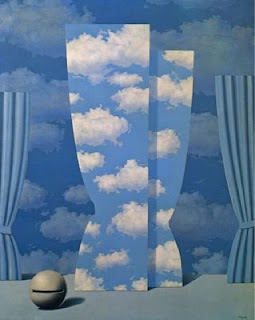 I love his skies, all flat and smooth and with a perfect colour gradation, or pure happy blue with puffy clouds. One thing that struck me is that he painted really flat, no texture, no obvious layers, just a really fine, flat, coat of paint. Apparently, this is an attempt at focusing the attention to the subject in the painting rather than to the actual painting. There are many recurring themes in his work: the man in the bowler hat, puffy clouds, the sky bird, the easel, the door, ... I don't really know what they mean, but then the one that really puzzled me was the sphere with a slit. I've read on some websites that it's a cow bell, but I'm not sure about that. It looks really sci-fi, like it's come from another planet! 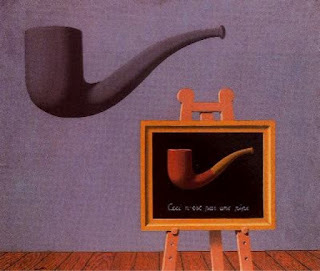 For a more erudite analysis of Magritte's works, check out this website, from which I took the reproductions of some of the paintings I like. Not all of these were at the museum, but it would appear that Magritte was quite prolific. Sunset on the Place du Grand Sablon. Great location if you like Belgian chocolates and cakes - Pierre Marcolini, Godiva, Wittamer, ... They're all there. And the Café Leffe serves a tasty waffle! Ingrid had recommended a few restaurants in Brussels. One of them was Yamato, a Japanese noodle bar near the Chaussée d'Ixelles. When we got there at lunchtime, we found that it only opens in the evenings. But there were a good few options around the Eglise Saint Boniface. After briefly considering a Korean restaurant (BB was tempted, I was reluctant), we settled on L'Ultime Atome, a big bistro/café type restaurant that serves a wide range of Belgian favourites, alongside a very extensive menu of Belgian beers. We were not disappointed. I had the gambas (though the salad is oriental only by name and by the addition of a few limes) and BB opted for the jamboneau with mustard sauce, with meat falling off the bone. BB tried a Kriek Mort Subite, a well-known cherry-flavoured beer. I think he liked it. A generous portion of mousse au chocolat rounded off an excellent lunch. There was a nice buzz around the place and service was good. I would probably become a regular if I lived in the neighbourhood. Unfortunately, I don't! 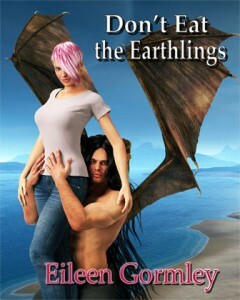 Don't Eat the Earthlings is the follow-on from Eileen Gormley's book Don't Feed the Fairies. Cytolene comes back to earth as an ambassador, with 3 fiancés in tow. The Earthlings are not as friendly as she had expected, and having to go for days without feeding on them is not easy! I read it on my Kindle (Christmas present!) while I was in Belgium last weekend. Another great read! Plenty of lively characters, a few new ones introduced along the way, with opportunities for a few sequels. Eileen Gormley doesn't write heavy science fiction. No, her stories are funny and full of engaging humans and aliens, and plenty of twists and turns. And I felt she wrapped up this one more elegantly than her previous book. As is the fashion nowadays, there is a teaser for her next novel at the end of the book (I didn't read it. I'll have forgotten about it by the time I get to download the next book from the Amazon Kindle store). I'd say there is lots more to come from this prolific and entertaining author. I can't wait! And for all of you out there who dream of getting a book published, here are a few wise words from Ms Gormley herself! And wise words from Judge Judy as recorded by Ms Gormley - priceless! We decided to play tourists in Belgium last weekend. So, instead of my Dad picking us up at Charleroi airport, we took the Shuttle bus to Brussels. Our flight was on time and we thought we'd be in Brussels before noon. Well, the software engineers who designed the interface at the shuttle ticket kiosks had other plans in mind! There were three kiosks and we started queueing at one, preceeded by three young Americans who were travelling together but decided to buy their tickets individually. Not the brightest! An impression that was confirmed when the young man turned around and asked if anybody spoke English. The credit card machine was saying "un instant svp" and he had no idea what it meant. Last I heard, "instant" is also a word in the English language. Maybe not in American?? The little trio spent more time looking at the machine in puzzlement. It just didn't like their card. At that stage, I didn't like them either. The next person got into difficulty even before she got to the stage of putting her credit card in. Again an American (I'm not implying anything here, just stating the facts as I remember them), she ended up just staring at the screen for a very very long time. I had to ask her if she was finished. That seemed to snap her out of her daydream. A British lady was next and she was done in two minutes, no trouble at all. She left saying that the 11-o'clock coach appeared to be booked out. When it was my turn, I got to the stage where you select the time of the coach you want to get on. I tried for 11:20 but the touch screen seemed not to work any more. Brendan tried it, and it only worked when he pressed 11:40. How clever! A machine that still shows you the times of booked-out coaches and doesn't tell you that the time you are trying to select is not available! Once we had that figured out, we were done within 1 minute. Well, we got the 11:40 all right, and we were in Brussels Midi less than an hour later. But for those of you planning that trip, I'll just say that there is also a manned desk a little further on, with a big long queue, but the attendant probably works more efficiently than the three little machines. Our first proper sunny day in Dublin. I have a bit of a cold, so I can't really go out to make the most of it, unfortunately. But I'm sitting out at the back, sheltered from the wind, and it feels good. Jay Hunter Morris was the big sensation of this year's Met Ring. The original singer pulled out at the last minute, and he stepped in and delighted everyone! Siegfried doesn't strike me as the most complex of characters - He is a big man, a warrior, a hunter, a lover, but he certainly does not come across as a schemer, a plotter or a thinker. Still, it's quite a role to step into at short notice! And he pulled it off beautifully. Again, he is the only Siegfried I know, but I feel he brought wonderful youthful energy and power to the role. And he seems like a quirky person too - he gave very entertaining interviews for the Met HD transmissions. Just look at the Intro page on his website, and you'll see what I mean. And he's easy on the eye, if you like the big rugged man look! The Return of the Little Black Dress: She has a sense of humour too! 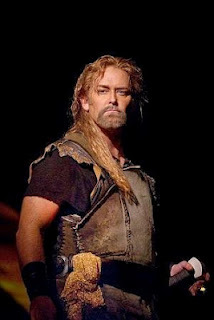 I did promise I would tell you more about the singers in the Met HD's Gotterdammerung. I didn't forget! I just got sidetracked. Deborah Voigt - the perfect Brunnhilde. 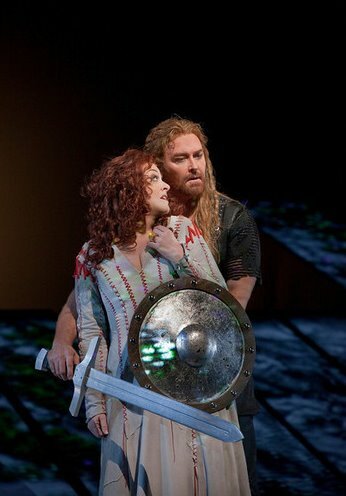 Well, the only Brunnhilde I know, since this was my first Ring! But what an introduction - beautiful singing and acting. Though it has to be said that the acting range in Gotterdammerung isn't too broad for Brunnhilde: she's very much in love at the start of the opera, very very cross in the middle, and very very sad but resolved at the end. But Voigt does it with great subtlety. And she's also a very credible-looking Brunnhilde, young and beautiful. She wasn't always so, I'm afraid. Not so long ago, she was a very very fat opera singer. So fat apparently that Convent Garden rejected her for one of their productions, as it was deemed that she wouldn't fit into the little black dress that apparently was so central to the story of Ariadne auf Naxos! Amazing what gastric banding can do!! Again, I'm way behind the curve. Most of the world has read The Slap, and have debated the issues raised in this book, but here I am, at least a year later, with my modest opinions! It's a great read. Even as someone who doesn't have children, I found myself passionate about the question of whether or not it was right for that man to slap someone else's child at a party. And like most readers, I found my views evolving as I got to know the characters, whose voices became heard bit by bit. The child was impossible, yes, but then you get to know his overprotective and righteous mother and his alcoholic father, and you think, well, it's not the child that needed a slap. The man who slapped him is someone's husband, father, cousin, nephew, a rich businessman. But he is far from the perfect man that his family knows and loves. But then, even the perfect wives we meet at first have secrets of their own. The action is set in Melbourne. The author, Christos Tsiolkas, is an Australian of Greek origin, and some of the core characters in the story are 1st and 2nd generation Greeks. I don't really know much about Australian society, so I found it fascinating to observe the interaction between the many cultures represented by the various characters. Now, I have to say that for the first few pages, I got really confused as to who was who. Which one was Harry? And what about Gary? Was he Greek or Australian? 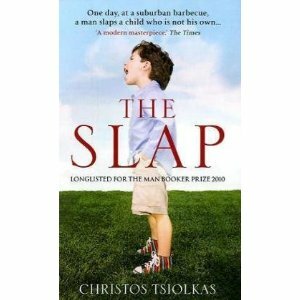 Father of the child or Slapper of the child? Prosperous businessman with a nice house and a nice wife, or a struggling artist who drinks too much and doesn't paint enough? There are a lot of characters in this story, but thankfully, each chapter after the first one focuses on one person, so you do get to know them pretty quickly. 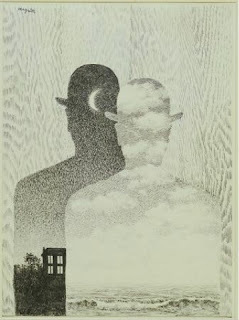 PS: If you want more intellectual book reviews, check out this blog. We watched The Descendants on Friday night. I really didn't know anything about it, except that George Clooney had an Oscar nomination for his role in it. And I've just found out that it got a nomination for Best Picture too. Whether this is Oscar material or not is debatable, but it's a lovely lovely movie. It doesn't have a complex plot or political intrigue, it's a simple little story of love and loss, and what you leave behind. George Clooney plays a husband and father whose wife is in a coma after a boating accident. 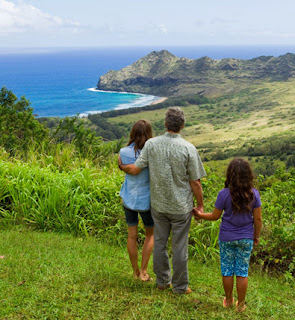 Through the movie, we follow him and his two daughters, and his emotions, as he flips between sadness, puzzlement, anger and acceptance, after discovering a part of his wife's life he wasn't aware of. It's funny and sad, just like real life. And it doesn't matter that you live in Paradise. No doubt the boys on the boards will be talking about Siobhan Ryan's appearance last night with this new dress and its revealing cleavage. Very flattering. She's got a great figure, and she's right to show it off!